Schloss Leopoldskron castle, one of numerous Salzburg locations from the film 'The Sound of Music'. Built around 1740 the iconic Schloss Leopoldskron castle has had a colorful history. The building's back facade, which faces a pretty lake known as the Leopoldskroner Weiher in Salzburg, Austria served as one of the views of the Trapp family house from the classic motion picture film The Sound of Music. During my first trip to Europe I undertook two quite different photography adventures. The first was to Iceland and Greenland. The second was a quick jaunt to Russia, Austria and Belgium. I also spent a few days in Paris at the beginning and end of the trip. The first adventure was largely self-guided, which is the way I've always travelled. But the trip through continental Europe contained a few half and full day tours. As I now run my own photography tours it seemed a good idea to experience a tour from a consumer's point of view. So, in addition to booking most of my hotel accommodation on the continent, my travel agent organized a short group tour for me in and around Salzburg where much of the Sound Of Music was filmed. Rain doesn't disturb tourists moving through Mirabell Gardens with the impossing Hohensalzburg Castle in the background. I have to admit I was taken aback at the recommendation to undertake one of the Sound Of Music tours in Salzburg. I'd probably seen the movie several times when I was a kid and, while I loved it then, I had absolutely no plans to investigate the making of the film in any way. In the end I was talked into a full day tour (though I kept it quiet), which I signed on for hoping it might be a bit of a giggle. In fact it was quite a bit of fun to visit some of the sites from the movie. It brought it all back, including some places I'd photographed a day or so earlier without knowing they'd appeared in the actual film. 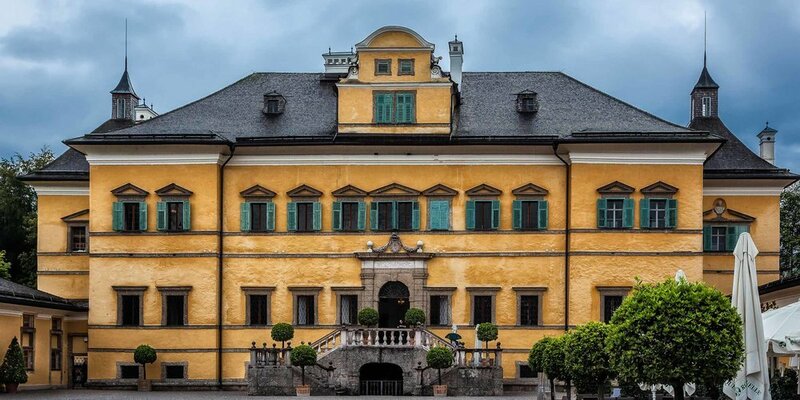 The butter yellow exterior of Hellbrunn Palace in Salzburg, Austria. The Gazebo from the Sound Of Music film is now located in the palace grounds. Our full day tour visited many locations, in and around Salzburg, that appeared in the Sound Of Music motion picture film and included an extended drive through beautiful Austrian countryside. Many of the houses we passed displayed beautiful flower boxes on their verandas and window sills. The beautiful village of St Gilgen backed by low lying clouds above Lake Wolfgang near Salzburg, Austria. We stopped half way down a mountain pass for a fantastic view of Lake Wolfgang and the lovely village of Gilgen backed by mountains and low lying clouds. I really appreciated the fact that our tour guide and driver provided us with ample time to walk around and make photographs of this lovely scene. Fantastic colors adorn the Cafe-Konditorei Braun and surrounding buildings in the town of Mondsee, Austria. On the way back we stopped at the lovely town of Mondsee where, as well as sampling excellent Apple Strudel and gorgeous vanilla ice-cream, we were given about an hour to wander around and photograph. I found the Basilica St. Michael, where Maria and Captain Van Trapp's wedding processional was filmed, to be particularly interesting. Statue of Pegasus, in the rain, at Mirabell Gardens in Salzburg, Austria. Maria and the Von Trapp children danced and sand Do-Re-Mi around the pegasus statue in the Sound Of Music film. 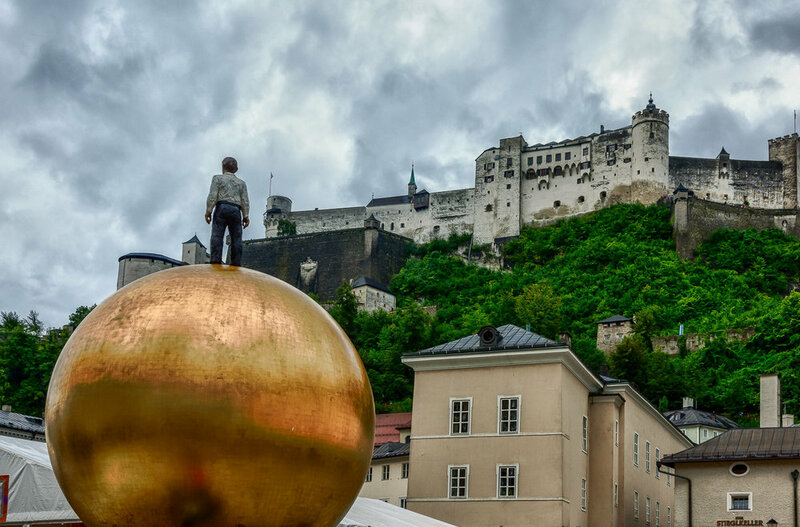 There are a number of Sound Of Music tours on offer in Salzburg. Some last a few hours, others a day or more. You can, of course, visit most locations from the film on your very own, do it yourself self guided tour. Here’s a list of most of the locations in and around Salzburg that featured in the Sound Of Music. So, even for a dyed in the wool solo traveler like me, the Sound Of Music tour was a lot of fun and one I'd be happy to recommend to the average tourist. Of course, like most other package tours, it's not ideal for the serious photographer. The locations themselves are very photogenic but would need to be visited at different times of day to enhance their photographic appeal. I'd like to think I’II be able to offer a special European highlights tour for photographers at some stage in the future. Oh, by the way, there are no Kangaroos in Austria. I know, I bought the T-shirt.